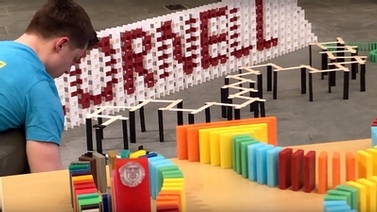 Fourteen regional schools duked it out for top spots in the American Society of Civil Engineers (ASCE) Steel Bridge and Concrete Canoe competitions, hosted by Cornell April 24-26. Both Cornell teams showed major improvement over last year, with the canoe team's second-place finish propelling them to the national competition in June - Cornell's first trip to nationals since 2000. Cornell's ASCE chapter also placed second overall for the conference, which combines both the steel bridge and concrete canoe teams' performances. The overall winner of both competitions was Montreal's École de Technologie Supérieure.